Bonhoeffer has gained a position as one of the most prominent Christian martyrs of the last century. His influence is so widespread that even 60 years after his execution by the Nazis, Bonhoeffer's life and work are still the subject of fresh and lively discussion. As a pastor and theologian Bonhoeffer decided to resist the Nazis in Germany, but his resistance was not solely theological. As a young theologian he had joined the Confessing Church soon to become one of their theological leaders and principal of the secret seminary at Finkenwalde in Pomerania. It was here that he developed his theological visions of radical discipleship and communal life. In 1938 he joined the Wehrmacht's Abwehr or Counterespionage in order to seek international support for the plot against Hitler. Following his inner calling and conscience meant that Bonhoeffer was continually forced to make decisions that separated him from his family, friends and colleagues and which ultimately led to his martyrdom in Flossenburg concentration camp, less than a month before the second world war came to an end.His letters and papers from prison movingly display the development of some of the most provocative and fascinating ideas of 20th century theology. Sixty years after Bonhoeffer's death and forty years after the publication of Eberhard Bethge's ground breaking biography, Ferdinand Schlingensiepen offers a definitive new book on Bonhoeffer, for a new generation of readers. Schlingensiepen takes into account documents that have only been made accessible during the last few years - such as the letters between Bonhoffer and his fiance Maria von Wedemeyer. Schlingensiepen's careful narrative brings to life the historical events, as well as displaying the theological development of one of the most creative thinkers of the 20th century, who was to become one of its most tragic martyrs. Dietrich Bonhoeffer 1906-1945 by Ferdinand Schlingensiepen was published by Bloomsbury Publishing PLC in March 2012 and is our 9519th best seller. The ISBN for Dietrich Bonhoeffer 1906-1945 is 9780567493194. 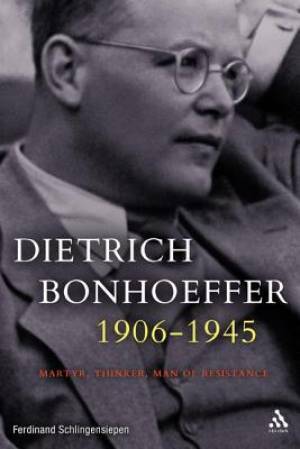 Be the first to review Dietrich Bonhoeffer 1906-1945! Got a question? No problem! Just click here to ask us about Dietrich Bonhoeffer 1906-1945.